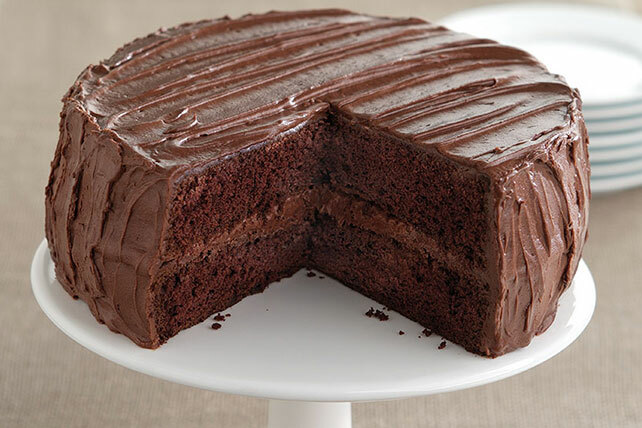 Look no further than this one for the perfect chocolate cake recipe. This Wellesley Chocolate Cake recipe is time-tested and a classic that can't be beat. Microwave chocolate, 1/2 cup sugar and water in large microwaveable bowl on HIGH 2 min. or until chocolate is almost melted, stirring after 1 min. Stir until chocolate is completely melted. Cool. Mix flour, baking soda and salt. Beat butter and remaining sugar in large bowl with mixer until light and fluffy. Add eggs, 1 at a time, beating after each until well blended. Beat in flour mixture alternately with milk. Add chocolate mixture and vanilla; mix well. Pour into 2 greased and floured 9-inch round pans. Bake 30 to 35 min. or until toothpick inserted in centers comes out clean. Cool in pans 10 min. ; remove from pans to wire racks. Cool completely. Fill and frost with Easy Chocolate Frosting. Enjoy a serving of this rich fudge cake on special occasions. Cook chocolate and water in medium saucepan on very low heat just until chocolate is melted, stirring constantly. Add 1/2 cup sugar; cook 2 min., stirring constantly. Cool to lukewarm. Continue as directed.